PRISTINA (Kosovo), January 29 (SeeNews) – Kosovo will suspend the import tariffs on goods from Serbia and Bosnia if the U.S. and the EU initiate and support an international conference for concluding a legally binding agreement between Pristina and Belgrade, Kosovo's prime minister Ramush Haradinaj said. The purpose of the conference will be to resolve all outstanding issues between Kosovo and Serbia, Haradinaj said in a letter published on his Facebook page late on Monday, which he said he has sent to the ambassadors of the U.S., France, Germany, Italy, and Britain and the EU representative in Kosovo. In November, the government in Pristina increased import tariffs on goods produced in Serbia and Bosnia to 100% from 10% set earlier that month, saying the move aimed to protect Kosovo’s sovereignty and interests. In the letter, Haradinaj said that the U.S. and the EU will have to give public commitments and assurances that the conference will not consider changes in Kosovo borders, or partition of Kosovo, or land swaps of any nature whatsoever. 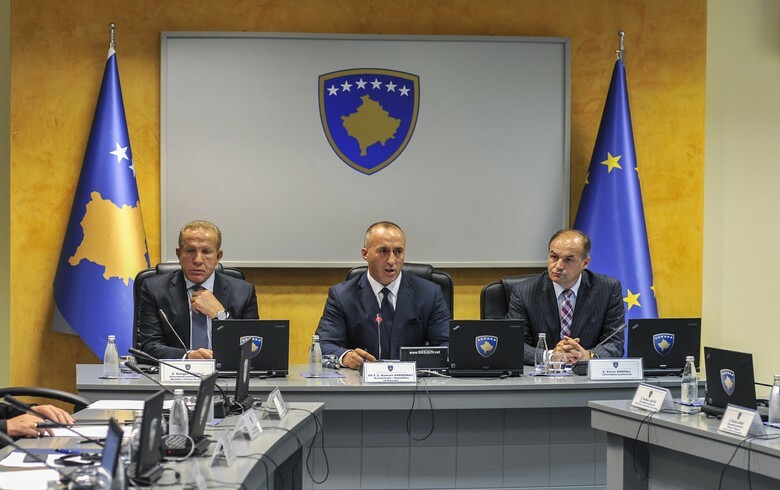 The conference shall not grant executive powers to any form of association of Serb municipalities in Kosovo or any other arrangement that violates the Constitution of Kosovo, Haradinaj said. He also said that the conference shall not discuss measures of any nature based on concessions made prior to February 17, 2008 - the date of Kosovo's independence. Haradinaj said that that EU must give additional public commitments and assurances that a visa-free travel regime for Kosovo citizens will be in force prior to the commencement of the conference and ensure that the energy agreement concluded in Brussels between Kosovo and Serbia be implemented and fully operational prior to the commencement of the conference. Kosovo will scrap tariffs if Serbia removes all non-tariff barriers imposed on the movement of goods from Kosovo as well as all unlawful restrictions on trade in services and movements of people from Kosovo to Serbia, Haradinaj stressed. He added that the Serbian president, prime minister or foreign minister should publicly confirm that all policies and actions of any nature directed against the aspirations of Kosovo as a sovereign state will be suspended permanently. The 100% tariff will be immediately re-imposed if the conference fails to conclude a binding comprehensive agreement between Pristina and Belgrade, Haradinaj said. Last week, the U.S. called on Kosovo and other regional stakeholders to demonstrate commitment to normalisation, regional peace and stability, and movement on the path to EU integration. “We reiterate our view that an immediate suspension of the tariff on imports from Serbia and Bosnia is one necessary measure to restore momentum to the dialogue process,” the U.S. embassy in Pristina said in a statement on Friday. Serbia and Bosnia both do not recognise the independence of Kosovo, the former southern province of Serbia populated predominantly by ethnic Albanians. Kosovo, considered to be a potential candidate for EU membership by the European Commission, unilaterally declared independence from Serbia in 2008 and has so far has been recognised by more than half of the 193 UN member states. It is the only country in the Western Balkans whose citizens need visas to travel to EU member states.